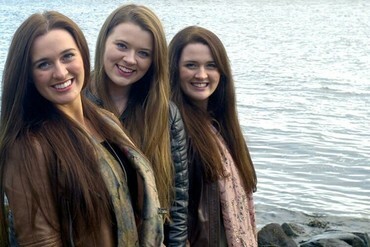 Glasgow born sisters Anna, Sheila and Clare Friel are young traditional musicians who use their Donegal ancestral culture to create a sound that encompasses the soul of Irish music. Being siblings helps them achieve a stunningly close blend on fiddle, flute and uilleann pipes, interspersed with songs in English and Irish, many from their family and local repertoire. Since the launch of their debut album, they have performed in various venues and festivals across Europe, America and Asia and have appeared as guests on stage or toured with acts such as Altan, The Chieftains, and Sharon Shannon. Clare has recently become the Young Traditional Musician of the Year at the 2018 TG4 Gradam Ceoil Awards, the first person Scottish person ever to win this. The Friel Sisters represent a new strand in traditional Irish music – they superbly balance a contemporary approach with an informed understanding of the Irish origins of their song and music.